Welcome to university. Now learn to fight! Council tax benefit: after lobbying? Defiance! Dozens of academics from Britain’s top universities — mainly professors of economics and business studies — have penned an open letter to the Times which calls for an end to national collective pay bargaining in the public sector. The letter proposes a scheme whereby individual public sector bodies could negotiate local pay rates, thereby allowing pay to more closely reflect the cost of living in a particular area. Greek workers are on general strike on 26 September, in protest against the new round of cuts planned by the coalition government. A number of strikes are ongoing. Nikos Fotopoulos, leader of the power workers’ union GENOP-DEH, has called for a rolling programme of repeated 24 hour strikes, with occupations of public buildings and permanent protest gatherings in public squares. French ferry workers employed by Brittany Ferries, which serves several ports in the UK, launched a prolonged strike against pay cuts and increases in working hours. The workers, who are members of the CGT and CFDT unions (both based in France), walked out on Friday 21 September after bosses refused to back down on plans to recoup some of the company’s £56 million deficit by increasing working hours by up to 25%. British and Polish members of the GMB at the Cranswick Country Foods factory near Hull have been involved in three days of industrial action over a proposed 20-30% pay cut by factory owners. The workers who have a permanent contract have also been subject to an 8 year pay freeze, while inflation has risen by 42%. The workers went on strike on 29 of August, and again on 6 and 7 of September, before returning to negotiations with management. Nora Connolly (1893-1981) was an Irish republican socialist and the daughter of the martyred revolutionary leader James Connolly. Born in Edinburgh in 1893 as the second of seven children, Nora had a turbulent childhood. Her family moved several times. It settled temporarily in Dublin in 1896. Then in 1904 it followed James Connolly to New York state after his emigration to the United States of America the previous year. With Mitt Romney’s scorn for “the 47%”, many left-minded people will conclude that they must support Barack Obama in the USA’s presidential election in November. The Democratic Party is firmly controlled by capitalist interests; Obama’s administration has increased inequality in the USA; yet the TUC’s pamphlet for 20 October sets up Obama’s policies as a model for Britain. “USA shows the way”. The attack and killings at the US consulate in Benghazi — killings orchestrated ostensibly around the protest against the Innocence of Muslims film — were, in reality it seems, long-planned. Many in Benghazi saw it as a reprisal attack for the US drone killing of a high-ranking Libyan al-Qaeda operative in Afghanistan. According to the Royal College of Physicians, acute hospitals are on the point of collapse. Emergency admissions have increased 37% in the last decade, but hospitals have a third fewer beds than 25 years ago. For a while the decrease in beds was matched by a shortening of patients’ stays in hospital, but that trend is now in reverse. Older patients are coming into hospital with more complex conditions and are staying longer. 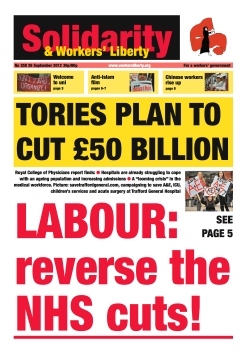 Meanwhile the Tories plan £20 billion cuts by 2014-5, and £50 billion by 2019-20.